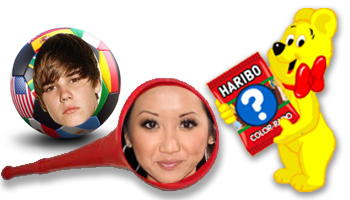 Tween sensations Justin Bieber and Brenda Song are set to endorse a new candy from Haribo called Vuvuzela Balls. Now that the news is out of the way… what?! What kind of a name is that? It instinctively makes me uncomfortable. Yes, I know the vuvuzela is the loud horn thing that buzzed throughout the World Cup games, but still. The name is apparently not necessarily “a keeper” (soccer pun, I kill me) and could be changed. From a marketing perspective, I can see how naming the candy after the now popularized horn can be beneficial to Haribo. I don’t even follow soccer, and I knew what it was. 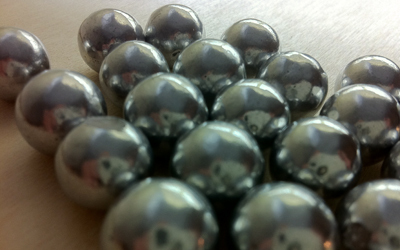 Vuvuzela Balls are bound to catch someone’s attention and cause a double-take. But, still. Eh, I’m just not sure I can handle “Would you care for a Vuvuzela ball?” Ok, I wouldn’t talk about it, but I’d eat it. Let’s give a big Candy Addict welcome to Gigi, our first Europe-based writer! As a Candy Addict, when vying for a sugar fix, gummi bears are fairly low on my list of “candy craving” sweets. On the other hand, if I was asked to buy candy for a large group of people, gummi bears are perfect and probably the safest option, catering to all sugar palates. Gummi bears are tasty, chewy, and a widely popular gummi treat. You know what youâ€™re going to get before you pop one in your mouth. 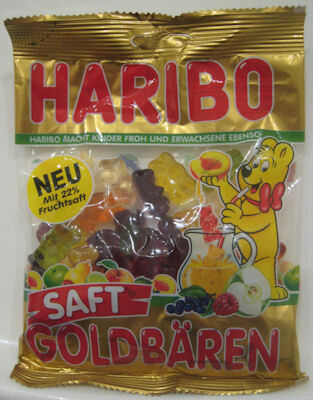 Recently, while shopping at a market in Munich, Germany, I noticed an interesting spin on the forever palatable gummi bear” Hariboâ€™s Saft Goldbaeren. Naturally, I gave them a whirl. Translated in English, Juice Goldbears are a unique, surprisingly tasty twist on the traditional gummi bear. Claiming 22% fruit juice, Haribo has not only mastered the gummi texture â€“ these bears are soft! – they have made this treat potentially healthyâ€¦ Seriously? Today was a good day for the licorice lovers in my house. Of course, there’s only one licorice lover here, so I guess it was simply a good day for ME! Today not only did I receive yet another Amazon.com package full of licorice, but I also got February’s selections of the Licorice of the Month Club. This month we got to enjoy Wheels by Haribo and Pontefract Cakes from England. I was intrigued by the Cakes, not knowing the origin of the name. It sounded kind of holy and church-ish, so I quickly googled it and discovered that Pontefract is actually a town in England where these sweets are produced. 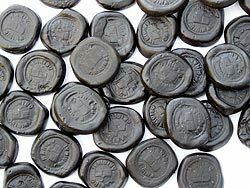 They are also made by Haribo, as evidenced by the imprint on each cake (one other company produces licorice candy in the town), and consist of black wafers about the diameter of a quarter. They are quite good, with a definite flavor of molasses and licorice. They fall quite clearly into the category of sweet licorice, and I found it difficult to stop eating them. Delicious! Next were Wheels by Haribo. 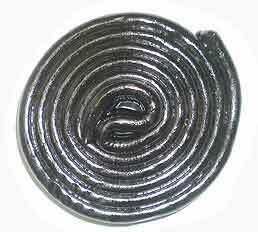 These are flat ropes of black licorice that are coiled into half-dollar size wheels. I found these difficult to bite into, and ended up unrolling a section to bite off and chew. This was somewhat time consuming, and I thought they were just a touch too firm for me. Still, the flavor was good, with a more subdued sweetness than the Cakes. As extra treats this month we received Kookaburra Natural Black and Kookaburra Natural Raspberry licorices. The black was lovely, very soft with a nice, sweet flavor. The raspberry was a bit harder, and didn’t appeal to me as much. It was very sweet, and the raspberry flavor was nearly overwhelming. Still, they were nice extras to enjoy. A few years ago, I spent a summer in Germany. Ever since then, I’ve been on a quest to find a certain candy that I loved but I cannot remember the candy’s name. So, to make me feel a little better, I tend to go on candy-buying sprees, looking for anything that might fill that void. During my most recent attempt, I purchased a box of Haribo Build-A-Burger bags, twelve in all. Yes, I admit it, I’m a Candy Addict. That’s why I’m here. Anyway, on with the review! 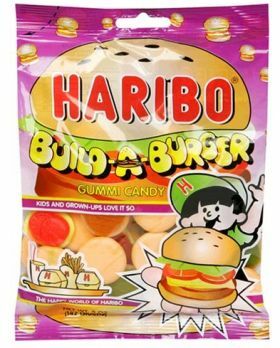 Haribo Build-A-Burger consists of three different gummi candies packaged together. One flavor is a top foamy bun with gummi lettuce, another a bottom foamy bun with gummi hamburger patty, and the third is a foamy cheese with gummi tomato. Put together, they would resemble a complete cheeseburger. Each flavor is slightly different, though none come close to any flavor I could put a name to. What I enjoy about these are the foamy backs – this is the texture I’ve been searching for in a gummi. It’s a very soft gummi, almost like a regular gummi minus the shine and with more air bubbles. The regular gummi front, however, is just exactly like most gummies out there today – firm and chewy, with a definite flavor. I prefer the backs, with their more subtle flavor and softer texture, but even I’m not desperate enough to go through and cut all the backs off to eat separately. Yet. Overall, it’s a very enjoyable candy, with a nice flavor and interesting combination of textures. I would think of it as more a novelty than something most people would seek out, but it’s certainly worth a try.